1. In a bowl, add 60 grams corn flour, 65 grams all purpose flour, 1/4 teaspoon salt, 1/4 teaspoon black pepper, 200 milliliters water and mix it well to make a thick batter. 2. Take 350 grams paneer and cut it into cubes. 3. 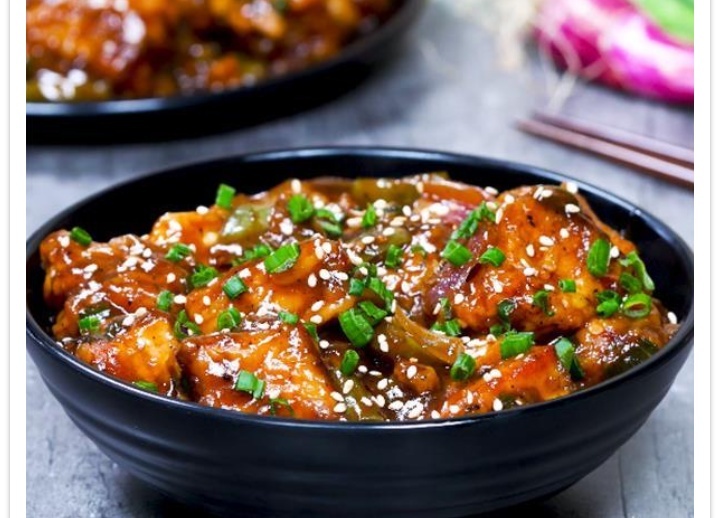 Take a paneer cube and dip it in the prepared mixture. 4. Heat some oil in a pan and shallow fry these until it turns golden brown in color from all sides. 5. Remove it form heat and drain it on an absorbent paper. Keep aside. 6. Heat 2 tablespoons oil in a skillet, add 1 tablespoon garlic, 2 teaspoons green chili and stir for 1 - 2 minutes. 7. Then, add 50 grams onions, 80 grams bell pepper and fry till translucent or until it turns golden brown in color. 8. Add 1 tablespoon soy sauce, 2 tablespoons ketchup, 1 tablespoon sweet chili sauce, 2 tablespoons honey, 1 teaspoon vinegar and mix it well. 10. Now, add 120 milliliters water and mix it well. 12. Add 1/2 teaspoon salt, 1/2 teaspoon black pepper powder and mix it well. 13. Then, add the fried paneer in it and mix it well. 14. In a bowl, add 1 tablespoon corn flour, 2 tablespoons water and mix it well. 15. Add this mixture into the skillet and mix it well. 17. Now, add 1 tablespoon spring onions and mix it well. 18. Cook for 3 - 5 minutes on medium heat. 19. Garnish with spring onions and white sesame seeds.